Many Pagan children grow up in mixed religion households, where one parent is Pagan and the other . . . is not. Even in households where both parents are Pagan, it is likely that their families are not. 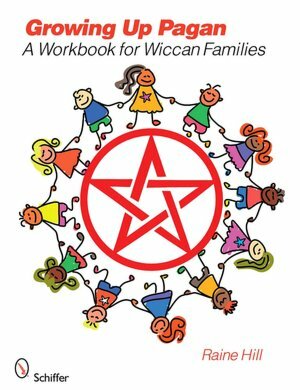 This has presented Pagan families with a thorny problem to solve: how do we, people who have no ‘Book’ that defines us, provide an integrated religious teaching system to our children? All Hail Raine Hill for creating a workbook that fills this need. It’s not perfect – I would have liked more on the Rede, for example, and it is strongly Celtic in focus, but those are small imperfections in an otherwise wonderful, practical workbook. Hill does a wonderful job of making it clear that there is no One True Way and focuses instead on foundation elements. Creation stories, delightful myths, how to set up an altar, the Wheel of the Year, and basic symbols are all incorporated and explained with a felicity of style that I found refreshing. At the very end is an Achievement Certificate suitable for framing.